Beat the cream cheese in a large bowl, set aside. In a large saucepan, add the cream, milk, ¾ cups sugar, and lemon zest together. Heat on medium until the cream mixture is steaming and simmering at the edges. In a medium bowl, briskly whisk the egg yolks, and slowly pour 1 cup of the cream mixture into the egg yolks, ensuring you are whisking the eggs constantly as you pour in the cream. Slowly pour the egg mixture back into the saucepan, while whisking the saucepan constantly as you poured the egg mixture in. Continue to heat and stir the mixture with a wooden spoon the mixture until it thickens. You can test this by running your finger down your spoon to see if a line remains. Strain the mixture through a fine mesh strainer into the bowl with the cream cheese. Whisk the mixture until there are no lumps (you can use an immersion blender to speed things up) and chill until the mixture reaches 40 degrees F – at least 2 hours, preferably overnight. 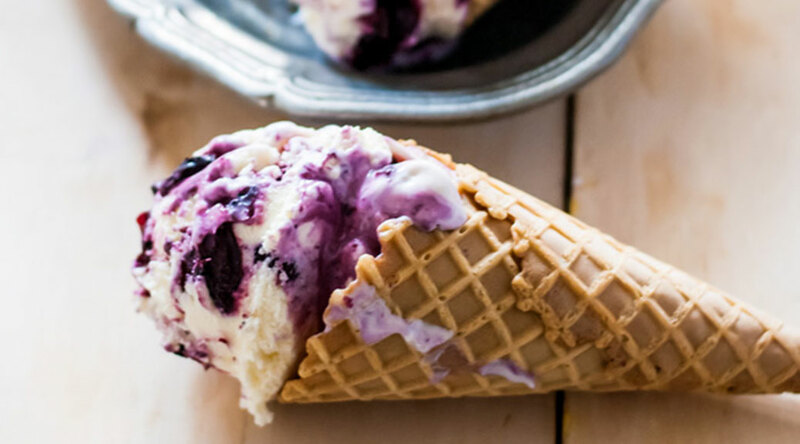 While the ice cream mixture is chilling, heat the remaining ½ cup sugar and blueberries together in a small saucepan until the juices escape the blueberries and begins to resemble syrup. Whisk in the red wine and allow the mixture to chill. Take out the chilled ice cream mixture and pour in the lemon juice and vanilla extract. *Churn in an ice cream machine according to manufacturer instructions. Begin to pour the ice cream in an air tight container, Drizzling the blueberry sauce (and graham cracker crumbs if using) between layers of the ice cream. Allow the ice cream to freeze for about 3 – 4 hours until firm.